Today I will show a group of five masks that I bought from Jaled Muyaes and Estela Ogazón on January 11, 1998. All of them were originally from Huayacocotla, Veracruz, although one had been found in Tempoal, Veracruz. All are unusually large, which seems to be typical for Huayacocotla masks. 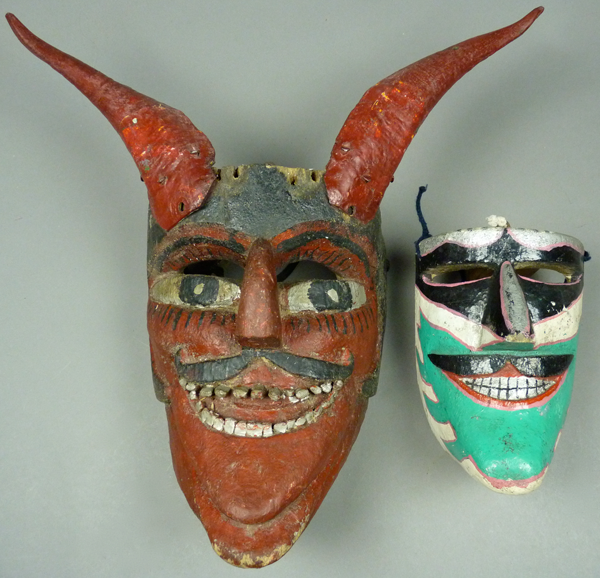 Jaled informed me that the first two of these masks were carved by the same carver. As you will soon see, the last three are clearly by another hand. 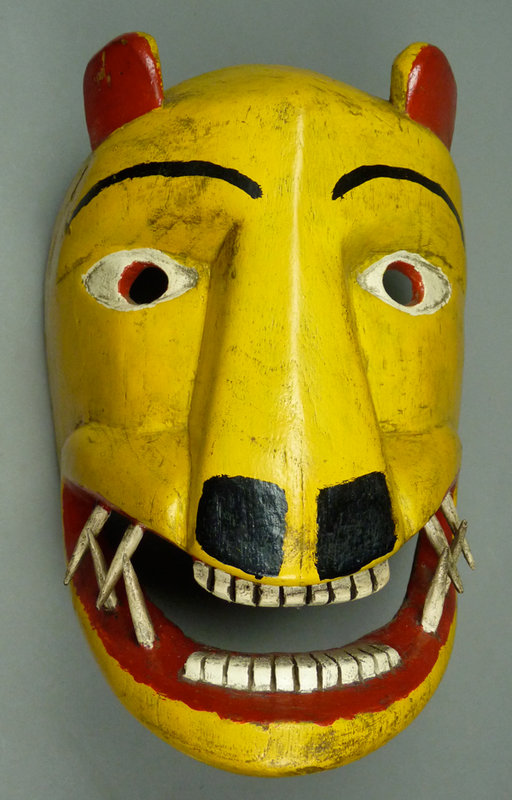 The first of these represents a Werewolf; it is a striking mask. This is the mask that was found by Jaled Muyaes and Estela Ogazón in Tempoal, Veracruz. When I show the side view it will be readily apparent from the size and the curving back edge that this is yet another mask by Modesto Sanchez. This mask was used during Carnaval. If the teeth don’t get you then the fangs will! Huayacocotla (sometimes alternatively spelled as Guayacocotla) is a town in a rural area of Veracruz, near the Hidalgo border. Carpinteros, Hidalgo is just a few miles up the road. Although these two towns are so close, they have distinctly different masks. 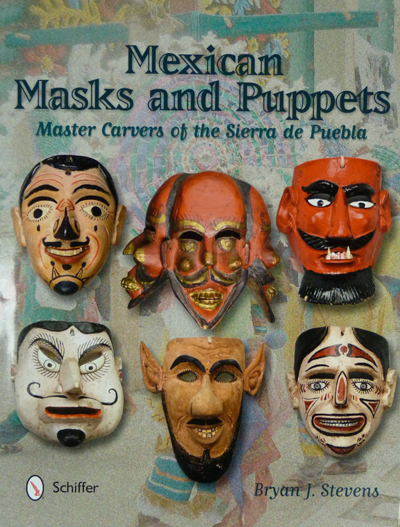 Today I will introduce you to some masks by a wonderful carver —Modesto Sanchez, who I understand lived and worked in Huayacocotla, Veracruz. These masks are unusually large and they have remarkable exaggerated features. Hundreds of miles north of Huayacocotla is the major city of Tempoal, Veracruz. Some of the masks that I attribute to Modesto were found there, raising the question of whether this carver might have lived in Tempoal, but I think that they were simply brought to that larger market by pickers, after use in rural towns. The first of these was collected in Huayacocotla by Jaled Muyaes and his wife Estela Ogazón. It is my understanding that they met Modesto there. 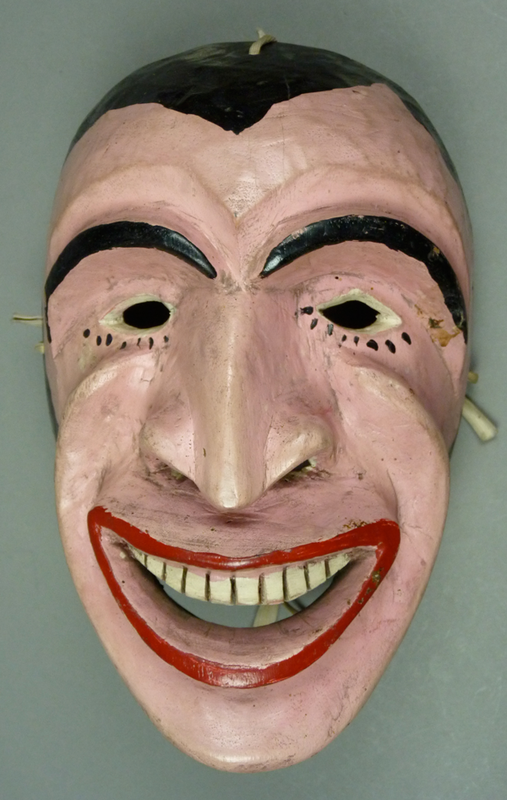 This mask has a woman’s hairline, and she danced during Carnaval (Mardi Gras). I obtained this mask in 2001. She has a jolly expression and exaggerated features, which will be even more apparent and impressive in the side view. 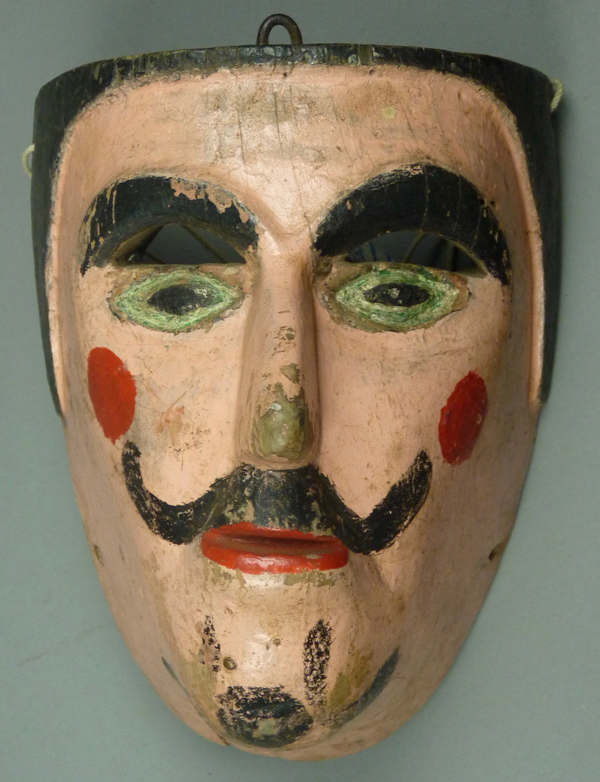 Sorting through my masks, I collected an assortment of “loose ends,” masks that are more or less closely related to others featured in recent posts. I will draw from this collection for a few posts over the coming weeks, while the previous related masks are still fresh in our minds. Today the emphasis will be on Diablo masks from Veracruz. I bought the first of these from René Bustamante in 1996. I liked it because it looked so much like an oversized Carnival Moor that had been fitted out with horns. Ironically, as I was gathering this assortment of masks I found an attractive Carnival Moor that I had overlooked when I did the post about those masks (February 8, 2016), so I will use that mask to compare the two styles. Here they are, side by side. The Diablo is about 1½ times the size of the Moor mask. This is the next in a group of posts about interesting and unusual masks that seemed related to others in recent postings. Today I will discuss a pair of Santiaguero masks from an unknown part of Veracruz and an additional “Negrito” mask from what I view as a Santiagos or Santiagueros dance in Naolinco. The first two Santiaguero masks were said to be from El Nanclola, Veracruz. I had the impression that this was a place in the Huasteca area, but I have not found it on any map. I pulled out these two masks because of their long noses, wondering if these represented an additional style of Azteca mask. However, my notes indicated that they had been sold to me as Santiaguero masks and I realized that their long slender noses were very similar to those of the Hormega masks (a Santiaguero variant) in the Sierra de Puebla of Puebla and Veracruz. The first, with a cross on the forehead, is certainly not a Diablo or an Azteca mask. 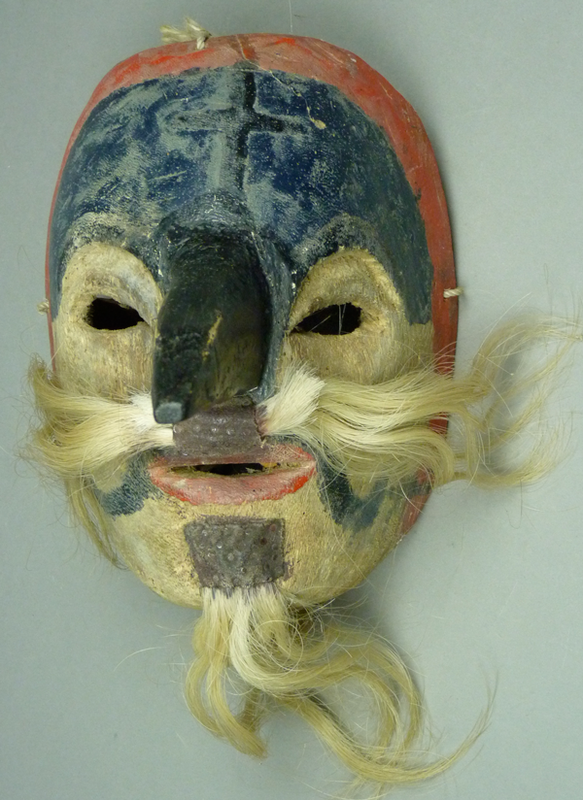 According to the Urmstons, those they met in the Huasteca called masks like this “mosquitos,” but this was a nonspecific term used for any mask with a long nose.